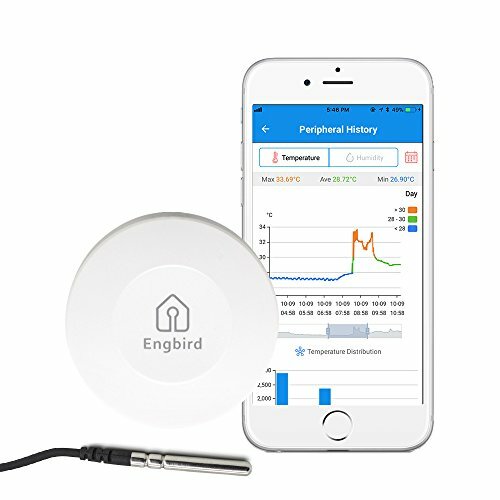 The Temperature & Humidity Smart Sensor IBS-TH1 Data loggercan be easy to pair with our mobile apps (Engbird). Which will provide the ideal solution for monitoring temperature and humidity conditions. IBS-TH1 can perfectly monitor your home, car, clothes, pet, fruit, cigar,wine and much more. -One phone can connect more than one IBS-TH1 at the same time. And one IBS-TH1 can be connected with more than one phone at the same time. Monitoring range: 50 meters / 150ft (No obstructions).Temperature Range: -40 ~140°F (Inner sensor) -40~212°F (External probe). Humidity Range: 0~99%RH. Inside and external probe are supplied. External probe can monitor the temperature of liquid. °C /°F mode and with magnet. Engbird app can be applied to IOS and Android system and support multi-language. History and Immediacy data can be remotely checked through Bluetooth. Hold data for 20 days if the sampling interval is 1min, the max date storage is 30000 point. Different sampling interval (10s, 30s, 1min, 2min, 5min, 10min, 30min) can be setting. The saving data time will be different if you choose different sampling interval. Multiple Devices: One mobile phone can monitor more than one sensor and one sensor can be monitored by more than one mobile phone. If you have any questions about this product by Engbird, contact us by completing and submitting the form below. If you are looking for a specif part number, please include it with your message.